Each style of KYMA is named after a Greek island reflecting the aesthetic and feel you get from each one. Just like the islands, each one has its own idiosyncrasy, but they all share the blue sole. This is a reminder that all the Greek islands even though appear as worlds of their own, small oases, sometimes set apart from the rest of the world, they all "sail" the Greek blue sea. KYMA pays tribute to the Greek seas with its distinctive blue sole and its name which in Greek means wave. 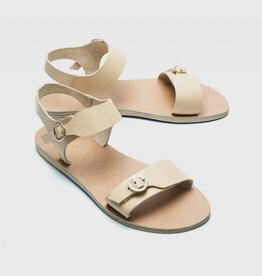 All sandals are handmade in Greece by expert craftsmen using a range of fine genuine leather. The top is made from natural vegetable-tanned vachetta leather. This type of leather is untreated and darkens with age and sunlight creating a patina. These subtle variations in shading and texture over time add to the sandals unique identity and beauty. The sole is comprised of three layers of special sole leather and a thin rubber heel that ensures stability. Sole leather is a harder material that is ideal for soles due to its long lasting durability while at the same time it is able to provide comfort to the foot. The fact that there are three layers, with the one in the middle being the faded gradient, is what makes KYMA sandals so comfortable. Because they adhere to the anatomy of the foot, all the while appearing to be flat sandals.